I'm taking a little break today from SAB samples. I made this name frame for the new vice principal at the school where I use to teach. I still substitute there quite frequently and I absolutely love the new VP. She's fun, quirky, and speaks her mind..kind of like me! She mentioned to some of the office staff that her office looked plain and they all had "those pretty name plaque things". I had made the entire office staff name frames a few years ago. So, today I dug out my retired Crayon Kids set and went to work. All products from Stampin' Up! except I used my Pazzles Inspiration to cut out the letters for her name but I used Stampin' Up! cardstock...there is no other in my house! The "kids" bodies were cut to lengthen them so they could hold the letters. I really love the way this turned out and can't wait to give it to her! I haven't done a name frame class in awhile, maybe it's time for another one? I forgot how much fun these are to make! These are so fun! 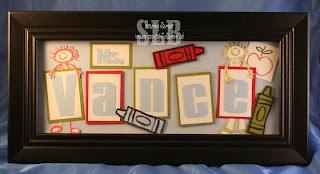 Love the colors and the 'blocking' inside the frame! This is soooo cute! Now I wish I had that stamp set! LOL! It turned out fabulous and she is going to love it! This is soooo cute. Great Idea. I love the name frame! So very clever and soo cute. Wish I lived close by so I could attend your classes!!! Love your work!! Thanks for sharing it with us. Oh, I love the name frame! Wish I lived closer where I could attend your classes.